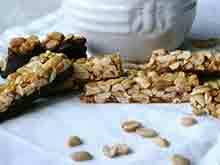 Enjoy this great energy boosting snack as part of your Healthy Way of Eating. And it only takes 10 minutes to prepare. Be careful when offering to kids as some may have allergies to peanuts.